Dear Apple: hands off our books! Every silver lining has a cloud, and in Apple's case the dark cloud in its otherwise sunny Californian world is the occasional lapse into control freakery. This week brings a particularly breathtaking example: if you install iBooks Author, Apple's new program for making ebooks, the licence agreement gives Apple your children, your dog and your car. OK, not quite. But what it does do is prevent you from selling your book anywhere but iBooks - and if Apple doesn't like your book, that means you can't sell it anywhere. "If your work is provided for a fee," Apple says, "you may only distribute the work through Apple". If Microsoft did this we'd have Steve Ballmer's head on a pike. I've seen the pro-Apple arguments on this one and I don't agree with them. This isn't the same as Xcode, Apple's coding environment, because if you create an app Apple doesn't like you can still sell it outside the Mac App Store. With an iBook, if you fall foul of "Apple may determine for any reason and in its sole discretion not to select your work for distribution" the licence says you can't just use the PDF export and stick the result on Smashwords. I don't agree with the "it's free, so shut it" argument either. Garageband came free with my Mac. If I make a song in it, I don't think it's up to Apple to say whether or where I can sell it. Apple's not just claiming rights to the finished compiled file. It's claiming rights to everything you've done in the program. Believe me, turning a manuscript into a book isn't easy. Just getting the text and layout just-so is enormously time-consuming; if you also start adding other goodies, such as interactive elements, the time and costs go into orbit. Then there's the editing, and the proofing, and the testing of any interactive or animated elements - and remember we're talking textbooks here, so there's the cost of fact-checking it too. Large projects take months and cost thousands. For Apple to say to publishers that they should invest all that time and cash into a project and then bin it if Apple doesn't like it is breathtaking. What I hope has happened here is that the legal department has made a mistake. Maybe the intention was to say "hey! 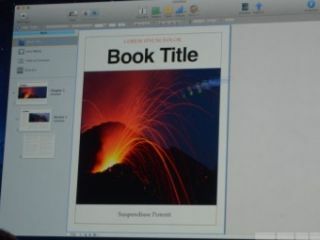 These templates can only be used if you're selling into iBooks", or "hey! If you want to export, you can't use any of these fonts". Which is fair enough: plenty of music programs have samples you can only use for the tutorials, or a program might include sample photos that you can't use in paid-for products, or that you can use online but in print. If that's the case then I think Apple deserves the benefit of the doubt here - but not for very long. In this story, Apple's looking very like the villain.